This week I’ll be drawing from my “archives” for an interview with Mike Seeger, multi-instrumentalist, field-recordist, record producer and 1/3 of the New Lost City Ramblers. This interview is from a tape of one of my old radio shows from college. It was conducted in May 0f 2003 at WOBC, the radio station of Oberlin College in Ohio. This was my first real radio interview! I had booked Mike to come and play at the Oberlin Folk Festival and while in town he appeared on the weekly radio show I hosted with my friend Jacob Groopman. 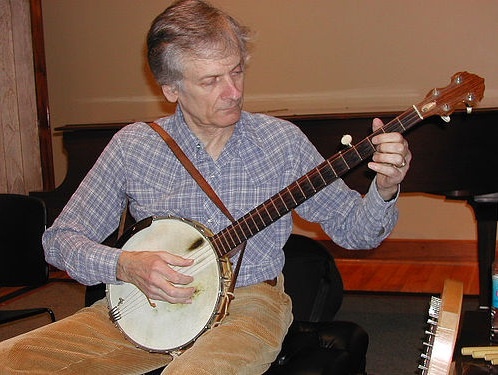 We talk about his parents Ruth Crawford and Charles Seeger, Elizabeth Cotton, Dock Boggs, Josh Thomas, Henry Thomas, Alan Lomax, the current state of folk music and more, and Mike plays some gourd banjo and jaw harp live on the air. Included above are the interview with Mike, and a recording of his appearance at the Oberlin College Folk Festival, May 2003. Special thanks to Tom Reid of Oberlin College for providing the live recording of Mike Seeger at the Oberlin Folk Festival. Talking Feet – A documentary produced by Mike Seeger on Southern buck and flat foot dancing. Its awesome and you can watch it online for free at FolkStreams.net! Southern Banjo Styles – A series of DVDs where Mike Seeger teaches a very wide variety of banjo styles. This is the best video instruction available on how to really play old-time banjo. Articles on Ruth Crawford, and Charles Seeger Mike Seeger’s mother and father. Article on Thomas Hart Benton who turned Mike’s parents on to Dock Boggs. today i hear at my house near sumida-river. thanks for your mike seeger interview-your first real radio interviw. Excellent interview! Great to hear him play the gourd banjo and drop some great anecdotes. Perhaps you guys should try and get an interview with Michael Hurley. He’s a tough nut to crack but once he gets going it can make for some fun stories and surely some Tom T. Hall covers. Thanks so much for doing this originally, and for sharing on this site. I was a student at UCLA from 1960 to 66 and Mike played often in the area. His Dad was on the faculty in Music, and Pete Seeger was the host of The UCLA folk Festivals of 64 and 65. An exciting time. Came across a YouTube video of Mike playing with Gilles Apap, Peter Feldmann and Jim Wimmer from a May 1, 2008 show at Santa Barbara’s Lobero Theater. Wonderful show and special chance to hear Mike’s stories. A memorable evening. Thanks so much for posting your 2003 interview. Mike seems like such a warm person with a gift for sharing.